This article was created by Tumblr user tk-603, who previously wished to remain anonymous, who first noticed the similarities between the fanfiction and The Last Jedi. The article was intended to be shared among those who had read the story and noticed the similarities for themselves. The author isn’t claiming plagiarism of the movie; they just want answers as to why the heck Rey’s origins, Phasma’s staff, and the plot of the Rey/Kylo interactions are so damn similar, because it’s really freaky. You can read the full address here. This post contains major spoilers for Star Wars: The Last Jedi. Shortly after The Last Jedi premiered in LA, the Internet was buzzing with rumors discussing the big reveals, plot points, and spoilers that the film had to offer. One person who caught the movie early happened to notice some striking similarities between the plot of the film and a fanfiction that they read months ago. They posted it to Tumblr, someone posted it to Reddit, and as these things go, it went viral and left many scratching their heads, wondering how one fanfiction could possibly predict exactly what happens in The Last Jedi. If you’ve ever browsed through Star Wars fanfiction on Archive of Our Own, you’ve probably ran into the name streetsolo at one point or another. She’s the writer of the Signs and Smoke Signals trilogy, consisting of books A Flare in the Dark, A Candle in the Night, and A Glow in the Dawn. The trilogy is enormous: with over one million words, it’s longer than the Harry Potter franchise and has over sixty thousand views spread between them. The series was written and published starting in 2016, just one month after The Force Awakens came out. In other words, too soon for the story to just be based on leaks and rumors. Your parents were filthy junk traders who sold their only daughter for drinking money. With all of the possible theories surrounding Rey’s origins: she’s a Skywalker, Kenobi, related to Palpatine, birthed by the midi-chlorians just like Anakin was – it’s strange that they both share the same origin story, especially when it’s so out of the box that it’s something that most people wouldn’t have even considered. The lines have an eerie similarity, but there is a possibility that that could simply be coincidence. After all, it’s just one thing, right? Possibly, but it gets a little stranger when you read on and discover that the story basically revealed the entire plot…only two months after The Force Awakens came out and before any script was finalized. In the story, A Candle in the Night, the Reader has been living on the Resistance base, undergoing training to develop her powers in the Force. Snoke bridges their minds and manipulates them through a Force bond that allows them to communicate long distance. The vision compels her to think that there is something good in Kylo Ren, and so she willingly goes to him in order to try to convince him to come back. In the story, Kylo Ren lets Snoke think that he is servile and submissive while Snoke taunts him and tells him that he can’t shield his thoughts from him; then Kylo turns and attacks him without Snoke realizing it. At one point, both her and Kylo grab for the lightsaber at the same time and it’s frozen in place between them. The stalemate is only broken when an explosion rocks the ship and they’re both knocked unconscious. There are only two small differences: for one, the lightsaber doesn’t break. 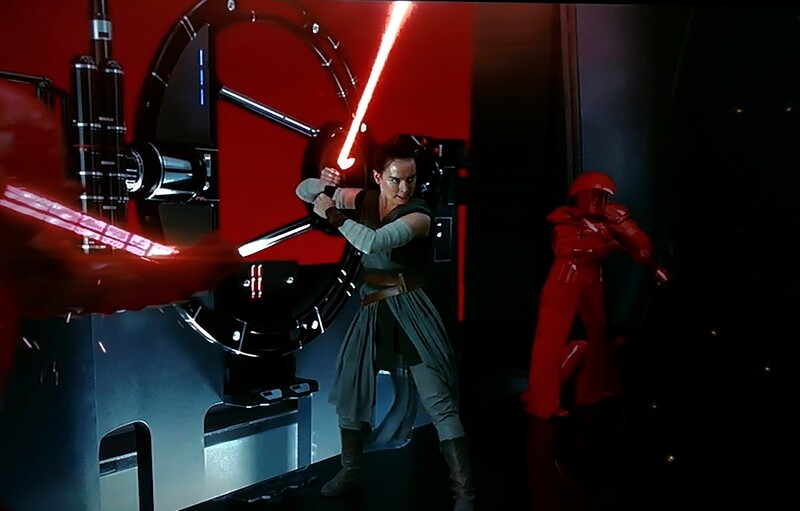 The lightsaber torn between them is also Kylo Ren’s lightsaber: she summoned it to her and was fighting with it after she was disarmed. You know, kind of like Rey did. That does sound eerily reminiscent of the plot of The Last Jedi, doesn’t it? Remember, in the film, Rey’s training is interrupted with a vision from Snoke when he bridges their minds and manipulates them through a Force bond and allows them to communicate long distance. The vision is what compels her to believe that there is still some good in Kylo Ren, so she willingly goes to him in order to try to convince him to come back to the light. Then Snoke taunts Kylo, while he pretends to be service and obedient, before turning the lightsaber on his former master. Later, the lightsaber is frozen in place between them, and the stalemate is only broken when an explosion rocks the ship and they’re both knocked unconscious. Rey seems to wake up first, leaving her enough time to get away. If this is a coincidence, it’s a pretty bizarre one. Even back during the initial photo shoots, the Internet was buzzing with rumors that the author “got it right” when everyone noticed that Captain Phasma was fighting with a staff. In the story, its her signature weapon, and the one that she uses to train our protagonist with. In the story, the staff contracts and expands to make it easier to carry…you know, sort of like it did in the movie when you see it expand just before she’s about to fight Finn. Except this story was written only one month after The Force Awakens hit theatres. There are a lot more strange similarities scattered throughout the story. Touching hands is used throughout the story as a way to feel each other through the Force and evaluate Force potential. Kylo Ren consistently has Force visions of things that may come into pass in the future, but only as far as the protagonist is concerned: just like how he believed he saw Rey’s future when he was taking her to Snoke. In the story, Yoda’s Force Ghost, as well as the Force Ghost of other characters, make an appearance several times. The story delves more into the mythology of the “veil” separating the Force Ghosts from our world and explores that connection, how Jedi and other Force Sensitive beings that have passed on can communicate through it. While nothing beyond Yoda’s Force ghost makes an appearance in TLJ, with Luke’s passing, it leaves the door open and may be something that JJ will tackle in Episode IX. After watching the film, many feel that Snoke’s death was wasted potential being killed off in only the second movie; however, Snoke is also believed to be dead in the second chapter of the author’s trilogy: until he makes a triumphant, unexpected return, revealing himself to have taken over Hux’s form. If this is something that happens in Episode IX, I think it’s safe to say the idea didn’t come from them. The similarities also continue with other characters: Leia changes Poe Dameron’s rank to Captain and encourages him to take on more of a leader stance within the Resistance with the plans for him to take over officially. While this story was written and published even before the death of Carrie Fisher, this still isn’t too much of a stretch prediction, considering this story is all about passing the torch to a new generation. Despite that, these are some extremely strange coincidences. Looking beyond that, the only other explanation is that Rian Johnson lifted some of his ideas from a popular fanfiction. It’s not the only time Rian has listed his ideas from another source: Rian lifted Luke’s Force Projection from the Dark Empire comics. One familiar scene is in Legacy of the Force: Fury, when Luke confronts Darth Caedus and uses the Force to keep him pinned to a chair. Luke seems unstoppable in this scene, and you don’t realize he’s a doppelganger until the very end when he vanishes…you know, kind of exactly like the last scene of The Last Jedi. I think Lucasfilm has some explaining to do. Update: Spencer Kornhaber, staff writer for The Atlantic, also wrote a piece on how elements of the Rey and Kylo interaction in the film were borrowed from a Reylo fanfiction. You can read that article here. with your vieᴡs on this websіte. johnson and kennedy should be ashamed of themselves. Except of course, for the fact that they have no shame. What’s truly sad to me is how little respect or love they have for the original trilogy, george lucas’ intended audience of children, the child within himself that george lucas was writing for, and the adventure-loving children that presumably lie buried somewhere deep inside of the grotesquely inhuman, blasphemous, conjoined demonic entity known only as kennedy/johnson. Whereas with the OT Lucas created an imaginary world (and galaxy) that he thought that kids of all ages would love, with TLJ, kennedy/johnson created a story intended to force children to view the world the way kennedy/johnson wanted kids to view it, to subtily but forcibly change their worldviews to align with that of kennedy/johnson. Lucas focused on creative, fictional world-building, while kennedy/johnson focused on changing real-life worldviews. And therein lies the failure of the Last Jedi. The idea that it was plagiarized from fan fiction should come as a surprise to no one given the utter lack of artistic joy, heart, or integrity of its creators. I never thought I’d say it, but i’m glad jar jar abrams is returning for episode IX. Aw, this was an incredibly nice post. Finding the time and actual effort to make a great article… but what can I say… I hesitate a whole lot and never seem to get nearly anything done.